Successfully Added Mini HDMI Projector - 800 Lumen, 4:3/16:9, 20,000 Hours Lamp Life, 1.07 Billion Colors to your Shopping Cart. Create a fun movie night, show photos from your last vacation and enjoy everything a large screen in a dark room can offer with this mini HDMI projector offering great brightness with its 800 Lumen, great viewing quality and an abundance of colors. This mini portable lightweight projector packs tons of fun for your home and lots of ways to improve your business presentations at the office. Simply turn off the lights and enjoy a real movie night in the comfort of your living room, in great company and with home made snacks. Had a fun time at recent vacation and can’t wait to share the experience? Why not show the best of your adventures on the large projected screen? Invite friends and family and make it party! Any presentation makes more impact with visuals. Wow your potential business partners and investors by always being prepared. 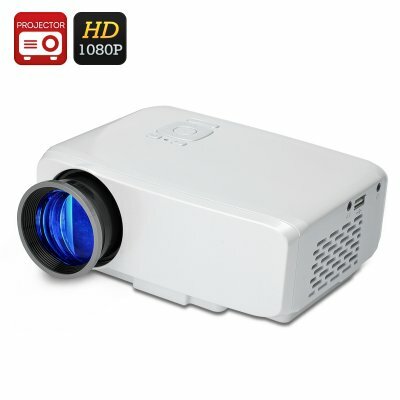 The mini projector is light and easy to have handy at the office or even bring along on a business trip. Offering 800 Lumens of brightness, the projector is sure to offer you a high quality picture - event when you can’t guarantee complete darkness. The LED lamps come with 20,000 hours of usage time – offering you lots and lots of time to enjoy the experience in full. With great connectivity thanks to USB, HDMI and VGA ports, the projector can be easily hooked up to other devices for more functionality. The projector also lets you view content from an SD card of up to 32GB. The Mini HDMI Projector comes with a 12 months warranty, brought to you by the leader in electronic devices as well as wholesale mini projectors..